Baroque column in oak wood, late 17th century. 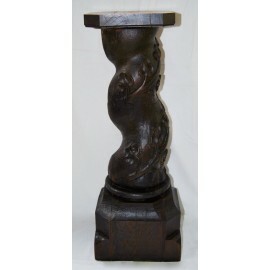 > DECORATIVE AND COLLECTIBLE ITEMS>Baroque column in oak wood, late 17th century. Baroque column in oak wood, helix shape, with vine leaf carvings, late 17th century. Ideal as a base for sculptures and vases. MEASURES: 71 x 26 x 26 cm.